G2 Esports received the first invitation to the Counter-Strike: Global Offensive tournament at DreamHack Winter. The tournament, set to run from Nov. 30 to Dec. 3, will be a DreamHack Open event featuring eight total CS:GO teams. Six of the teams will receive invitations from DreamHack, while the remaining two will earn spots through online qualifiers. One team will qualify each from North America and Europe. It's time for the invites of #DHW18! Starting off good, we got @G2shox and his squad of @G2esports join us in Jönköping! See them there by getting some tickets! 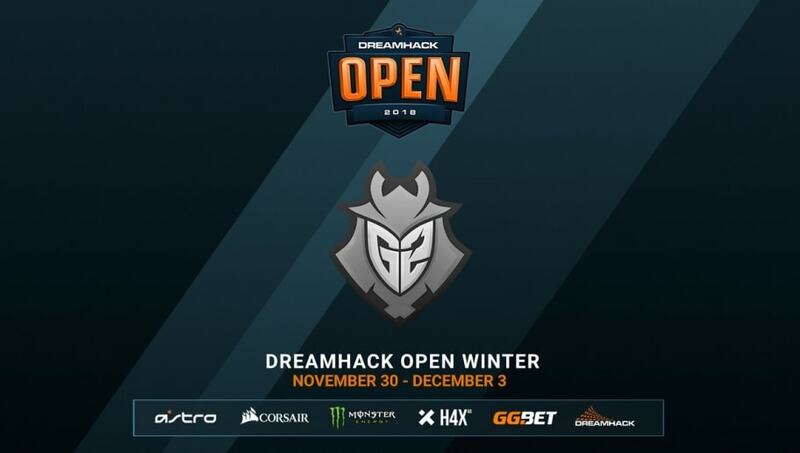 DreamHack announced the details for DreamHack Winter, its last event of the year, in December 2017 as part of its event calendar through 2018. The previous iteration of the tournament took place a few weeks before that announcement and saw Natus Vincere take home the trophy while its star player Oleksandr "s1mple" Kostyliev picked up an MVP award for himself. DreamHack Winter will also feature DreamHack staples such as a bring-your-own-computer tournament. Tickets currently on sale, with event passes available for 600 Swedish Krona, or around $66.